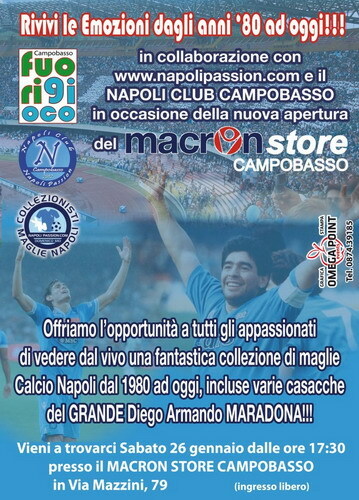 Ultima maglia Napoli inserita in Collezione! 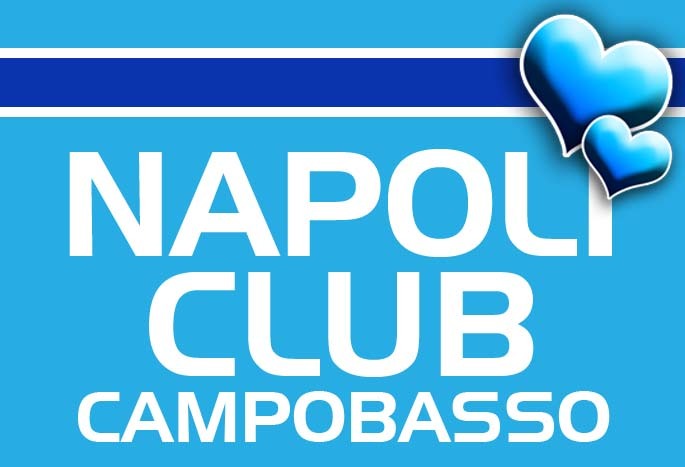 "CAMPAGNA ADESIONI 2018/2019 NAPOLI CLUB "
Napoli Club "Napoli Passion" Campobasso. 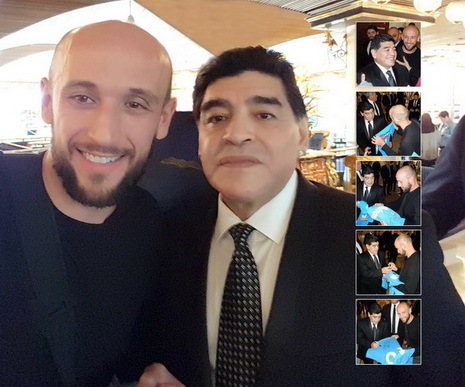 "12/10/2016 - CON DIEGO ARMANDO MARADONA"
"13/08/2016 - CON NANDO DE NAPOLI E LUCA ALTOMARE (AV)"
09/07/2016 - CON GLI EX NAPOLI TAGLIALATELA E LUCA ALTOMARE (ISCHIA). 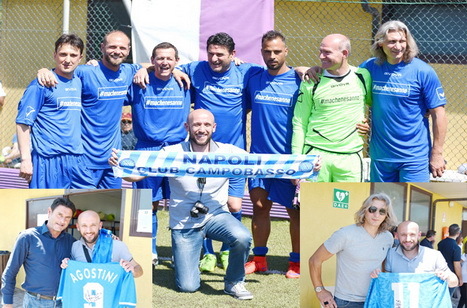 21/05/2016 - CON GLI EX AZZURRI DEL PROGETTO NOSTALGIA. 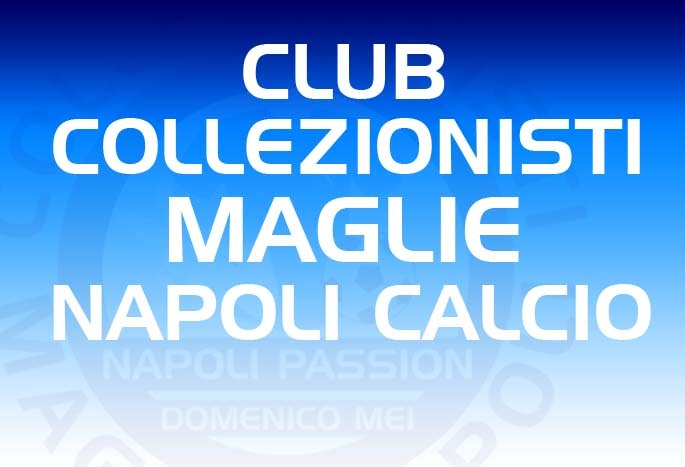 28-29/01/2016 - ESPOSIZIONE MAGLIE NAPOLI POMPEI (CB). 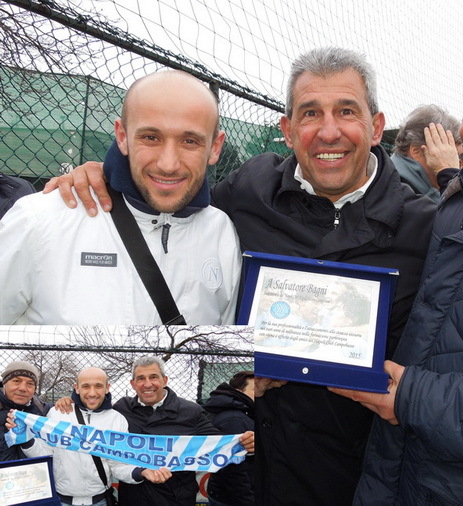 04/12/2015 - INCONTRO CON L'EX BOMBER AZZURRO ANTONIO CARECA. 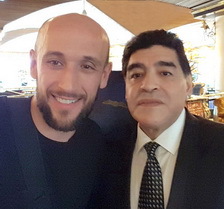 04/10/2015 - AL MEAZZA DI SAN SIRO MILANO PER MILAN vs NAPOLI= 0-4, NEGLI SPOGLIATOI CON GLI AZZURRI E CON I CALCIATORI DEL MILAN, A STRISCIA LA NOTIZIA CON DE LAURENTIS E LA CONSEGNA DEL TAPIRO D'ORO. 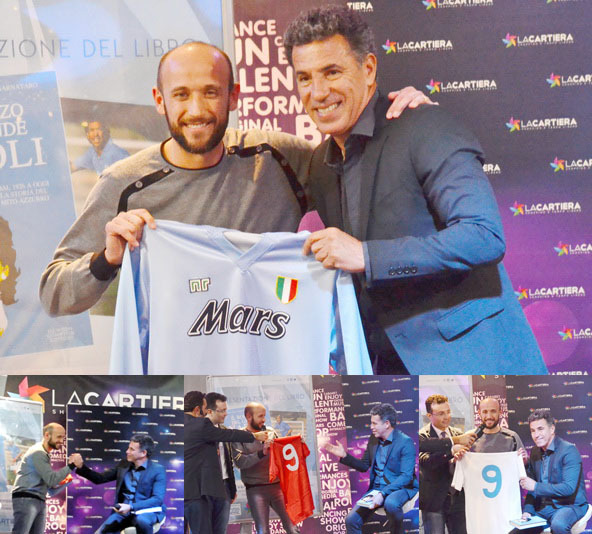 02/03/2015 - INCONTRO CON L'EX AZZURRO SALVATORE BAGNI. 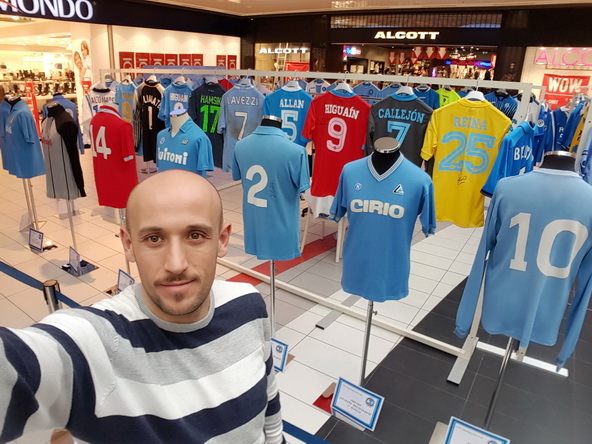 22/01/2015 - OSPITE NELLA TRASMISSIONE SPORTIVA "FANTACALCIO SHOW" SU CANALE 21 CON LE MIE MAGLIE DI ANDREA CARNEVALE PORTATE PROPRIO IN ONORE DELL'OSPITE D'ECCEZIONE. 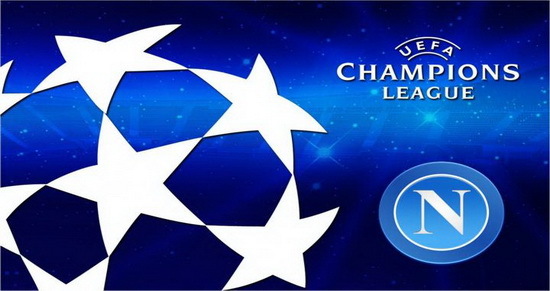 31/12/2014 - CON LA SUPERCOPPA ITALIANA VINTA A DOHA (QATAR) AL JASSIM BIN HAMAD STADIUM: JUVENTUS vs NAPOLI= 2-2, 7-8 dcr ( PRIMO TEMPO 1-0, SECONDO TEMPO 11, TEMPI SUPPLEMENTARI 2-2). 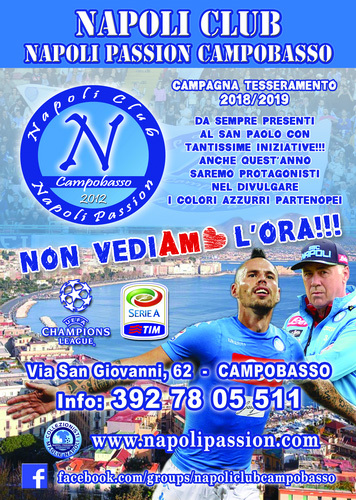 31/12/2014 - INCONTRO CON FABIO CANNAVARO E LUCA ALTOMARE PRESSO IL BAR CIMMINO A POSILLIPO. 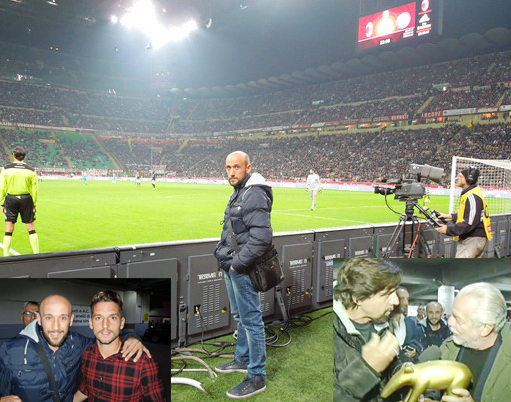 26/04/2014 - AL MEAZZA DI SAN SIRO MILANO PER INTER vs NAPOLI= 0-0 (35^ GIORNATA DI CAMPIONATO); DALL'INCONTRO NEL PREGARA CON IL PRESIDENTE AURELIO DE LAURENTIS E QUELLO DELL'INTER ERICK THOHIR, PASSANDO PER IL MATCH A BORDOCAMPO FINO AL SALUTO AI CALCIATORI NEGLI SPOGLIATOI.